You (or the registrar) mark the student incomplete by changing her status on the course roster. The course is finalized; the student's incomplete status is reflected on her transcript, degree audit, grade report, and anywhere else course grades are shown in Populi. As the student completes her coursework, you enter grades for it on her Student Course Summary page. When she has completed all of the coursework, you switch her from incomplete to enrolled by changing her roster status. Her enrolled status, together with her assignment and final grades, are finalized; her transcript, etc. are automatically updated. Go to the course roster. Click next to the student. In the dialog, select Yes next to Incomplete. Follow the instructions for finalizing an individual student found in this article (you can also finalize the course and all students...). The student is now listed as incomplete for the course on her transcript, degree audit, and all other reports. Her GPA and earned credits/hours will not include this course in their calculations. While not required, it would be helpful to give the student availability exceptions for her incomplete assignments. Doing so lets her submit work after the course end date. 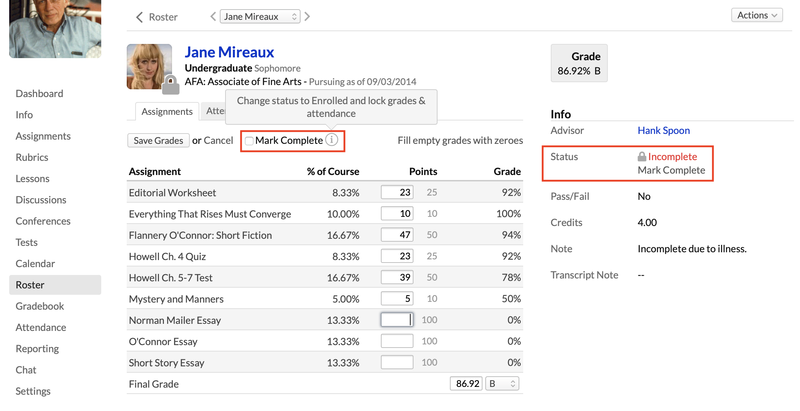 Click Mark Complete under the red Incomplete notice and then Enter Grades. 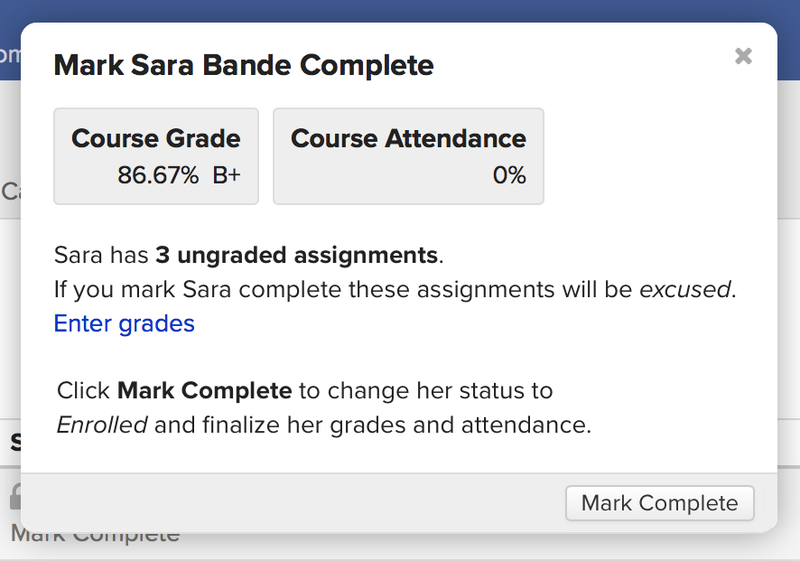 On the course summary, click Edit Grades under the assignments graph (if you got here via Mark Complete, the grading fields will already be opened). Click Save Grades when you're done. If the student has submitted all her work (or her time is up), check Mark Complete to switch her to Enrolled and finalize her grades and attendance. Any assignments you leave ungraded will be counted as excused—they will not be counted in her final grade calculation! If you do not wish to excuse an assignment that has not been submitted, you need to enter "0" for the grade (use the fill all empty grades with zeroes function to accomplish this in one fell swoop). Make sure you've graded or excused her assignments as appropriate. Go to the course roster or the student's course summary page. Click Mark Complete under the red incomplete notice. After verifying her final grade and attendance, click Mark Complete. After you mark her Complete, her roster status will switch to Enrolled. She will remain finalized in the course, and her grade will appear on her transcript, degree audit (and other reports), and her GPA and earned credits/hours will be updated. Enable comment editing after incomplete finalization.